Zero Tolerance and Emerson Knives put their hard-use heads together to create the 0620. 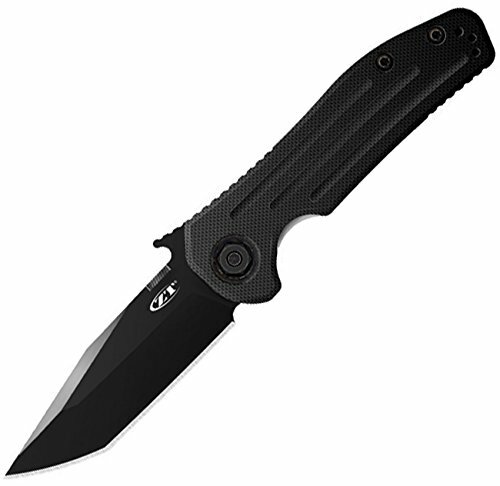 It features a blade of ELMAX powdered steel in a modified tanto style. ELMAX provides the extreme edge retention, high strength and toughness a hard-use knife demands. High wear resistance in a steel usually means low corrosion resistance, but not with ELMAX. With this advanced steel, you get both properties, which makes it an excellent blade steel. DLC coating enhances performance even more and makes the blade non-reflective. Of course, the 0620 features the patented Emerson "wave shaped feature" that enables the knife to be opened as it is removed from the pocket. By the time the knife has been fully withdrawn from the pocket, the blade is deployed and ready for use. A small wave-shaped tab on the top of the blade is built to catch on the pocket seam, opening the knife as it comes out of the pocket. This Emerson instant-open feature is a favorite among military, rescue and law enforcement knife users. The handle features a machined G-10 front scale with a bead-blasted titanium back. Blade lock up is ensured with a sturdy frame lock. Hardened steel inserts in the lockbar make it extra durable. Made in the USA. Wave shaped opening feature; Thumb disk for manual opening; Reversible clip; Frame lock, hardened steel lockbar inserts; Steel: ELMAX, DLC coating; Handle: G-10 front, bead-blasted titanium back; Blade Length: 3.6 in. (9.1 cm); Closed Length: 4.9 in. (12.4 cm).